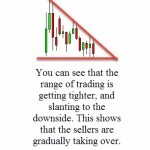 Ascending triangles, much like all triangles, are simply a sign of the markets tightening the range of motion that traders can go. The tightening range looks like a triangle as the highs and lows get closer to each other. Eventually, one side wins, and the markets move in their direction. The ascending triangle is a bit different than a symmetrical one as it “leans” in a direction. The lows of the triangle grow shorter and shorter over time, and the uptrend line on the lower boundary continues to constrict. However, on the top we have a steady amount of resistance, meaning that although there is a certain level the market cannot clear to the upside, sellers have less and less power every time they try to drive prices lower. This should indicate that the buyers are slowly starting to take control. As you can see by the formation above, there is a certain amount of resistance at the top of the triangle, but the sellers are failing to reach the same lows every time they push lower. Also, there is something else we should point out: The “height” of the triangle measures its potential target. What we mean is that if from the low to the highest point in the formation there is a 75 pip distance, when we finally break below the support – the markets should drop 75 pips. This is a phenomenon that you will see time and time again. On the trade below, once we broke above the top of the triangle – or the resistance – the market reached the target with very little trouble. This is a classic ascending triangle trade in action.